Hybrid Camera Revolution: Adorama offering free lenses or adapters with preorders of new JVC GY-LS300! Adorama offering free lenses or adapters with preorders of new JVC GY-LS300! 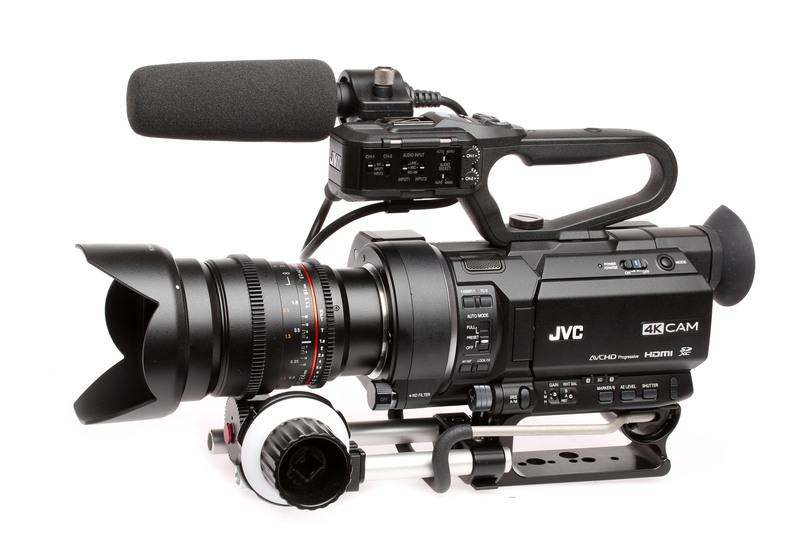 As reported earlier, JVC is going all-out to get its soon-to-ship Super 35mm camcorder into the hands of videographers and filmmakers with a terrific promotion - and the major online retailers have started to include it on their GY-LS300 product pages. Now, when you pre-order your new LS300 from Adorama for $3995, you get your choice of either a free Rokinon 24mm or 35mm cine lens - or a Canon EF, Nikon or PL mount adapter. This is a real bargain - "4K for $4K" (sorry, RED) - plus compatibility with your existing lenses straight out of the box (unless you're an NEX shooter :)). And the image quality is top-notch. I don't know how I missed this, but when Matthew Allard did his LS300 test a few weeks ago (which I wrote about in this post), he compared the UHD and HD output from the LS300 with UHD/HD output from the Sony A7s - both recorded to the Convergent Design Odyssey 7Q+ in ProRes. This is the camera many shooters have been waiting for since the beginning of the large sensor, interchangeable lens camera revolution - an affordable Super 35 camera with the ergonomics and features of a traditional camcorder - plus image quality that beats (or at least matches) the best of the still/video hybrids. This is very good news for JVC - and potentially bad news for Canon, Sony, Blackmagic and Panasonic - whose $4000 offerings are either less capable (Canon, Sony and Panasonic) or less ergonomically friendly (Blackmagic). Panasonic is especially weak in this price class, with the AF100 long overdue for a refresh. If Panasonic wants to compete with JVC in this market segment, any new "AG-AF200" will have come in below $4000 - especially if they stick with a micro 4/3 sized sensor. It's going to be an interesting NAB.